CHARLESTON, WV…Foodies from around the state are invited to celebrate the relaunch of Taste! West Virginia magazine at a special event scheduled for Thursday, October 26, from 5:30 p.m. to 8:30 p.m. at the new WV Market Gallery, located at 200 Hale Street in Charleston. Copies of the fall issue of Taste! 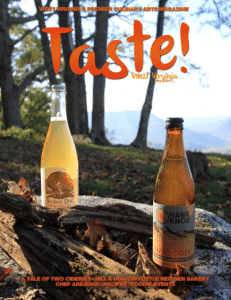 West Virginia will available to read and take home, and the pilot episode of the new Taste! WV web series will be shown throughout the evening. Jim Strawn and Johanna Miesner, hosts of the web series, will be in attendance. Event guests will be able to enjoy complimentary food from South Hills Market and Cafe, cider samples from Hawk Knob Hard Cider & Mead and Swilled Dog Hard Cider and smoothies from iFITT24. Ryan Kennedy will provide the evening’s entertainment. The first 20 attendees will receive a gift bag filled with goodies from area businesses. Click here for a video preview of the event. The event is free, open to the public and will benefit the Ronald McDonald House Charities of Southern West Virginia’s Meal Program. Guests will have the opportunity to donate RMHC at the event or via a link on www.tastewv.com and Taste’s social media pages. More information about the Meal Program can be found charlestonrmhc.org/get-involved/meal-program. The event is made possible through the support of Taste! West Virginia Magazine advertisers: Graziani’s Pizza, iFITT24, Island Teriyaki, Ivor’s Trunk, Pizza Barbarosa, Sarah’s Bakery, South Hills Market and Cafe, The Custard Stand and The French Goat. Taste! West Virginia is a quarterly publication highlighting the Mountain State’s ever-expanding culinary scene. In each issue, readers will find flavorful features on local eateries and handmade products, a profile on a talented chef or foodpreneur, event listings and, of course, yummy recipes. For more information on Taste! West Virginia, visit www.tastewv.com.